We get asked almost every day about the products we use and the resources we recommend. That’s why we believe this page will be helpful to those of you looking to quickly find solutions that you can trust. 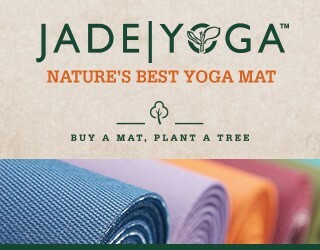 Jade Yoga Mats: Jade Yoga sells more than just yoga mats, but I personally love them just for their extremely high quality mats. Their mats are durable (mine has lasted over 3 years) and have extremely good grip, which is a necessity for beginners. They are also entirely eco-friendly with all of the products they make, and plant a tree for every mat that is purchased! They have planted over 1.5 MILLION trees so far! Yoga Blocks: Yoga blocks are so important when beginning your practice. They help you improve flexibility and maintain proper alignment without over extending yourself. The blocks I have been using for my home practice are made of foam, which are softer than blocks made of materials like cork, which I think is more comfortable and better for beginners in general. Yoga Strap: Yoga Straps are just as useful as blocks when starting your yoga practice. They help you relieve tightness and tension, and can really help improve your flexibility. They are small investment to make that can completely transform the way your body feels. Yoga Burn: Yoga Burn is a yoga program created by Zoe Bray-Cotton. We highly recommend it for all beginners who are seriously about building their yoga practice to meet their goals. It is a 12 week progressive program she created for her students to use while she was traveling, and has shown amazing results for thousands of women who did it all over the world. Yoga Toes: If you have a job where you are on your feet all day, or you have constant feet, or back pain, you need Yoga Toes in your life. I work 12 hour shifts as a nurse, so my feet were throbbing every time I got home.They separate your toes just enough to relieve built in tension and tightness in your feet.I started using these and noticed a huge difference! Rubz Ball: This little ball is great for relieving aching and throbbing feet. It specifically focuses on releasing the trigger points in your feet. Having tight feet that have knots in them are a big cause of pain that manifests in other areas of your body. This Rubz Ball is a great natural and affordable way to relieve pain . Eden’s Garden Essential Oils: I’ve been using essential oils since I was in nursing school, mainly to relieve stress, and have found so many other effective uses of them since then! Eden’s Garden is the only brand I buy after doing extensive research on a bunch of different brands. We use Lavender the most out of any- you can put it into a diffuser, use it in your cleaner or laundry detergent, and in self care products! Natural Calm: Natural Calm is our go to if we are having trouble falling asleep, or if we are super sore from working out. Magnesium is a powerful mineral that is very effective at relieving muscle soreness, anxiety, and promoting restorative, quality sleep. You just mix it in with your water, cold or hot, and then sit back and relax!